As I look around all I see is the blinding yellowy brightness surrounding me. The trees, the flowers and even the sky look the same. I feel annoyingly sick. I have just stepped out of the Royal Palace of Cambodia. The past one hour or so spent in the splendour of the Royal Palace has blurred my vision. My brain and my eyes have absorbed too much of the glitter of gold. The palace is now kept open to the public. The royal family occupies a smaller palace in the same compound. I had already visited the 'Silver Palace' in the morning. With overflowing gratitude to the royals for letting their abode being open for the public viewing, I walk through the neatly maintained lawn, weighing my good fortune of being able to visit and witness this magnificent arena. I am blessed enough to get a glimpse of an idea of my childhood imagination of royalty. As a child I always believed that royal palaces were made of gold. But my imagination of gold was different. To me gold was a glittery, colourful object and not a yellowy substance. It was only at a later stage of my childhood did I realise that real gold was a yellow metal. I was too disappointed the day they bore my ears to fix a flowery stud... I wanted to wear gold that was in varied fancy hues... not a monotony coloured hard object...! My imagination of princes and princesses in the bygone age too was that they were from a different world or planet...or something of that sort... They did not resemble us, the mundane human... In my imagination they were small made people with porcelain faces... with smiles... They wore long robes in pastel shades and delicately carved designer crowns. A smile crosses my lips as I am brought to reality of how innocent and beautiful my thoughts have once been. In a subtle moment I am saddened by the reality that I am no more a child who could dream such fantasies and be carefree. Adulthood has shattered many of my long embedded childish visions. I am amazed that I had lived with such silly fantasies and imaginations that had hidden within a corner of my heart till this day unknown to my own self. This place of glory and majesty had not disappointed me in its appearance. It fitted my imagination of glitter. However it is only now that I come to realise how sickening it could be to be surrounded by such luxury and monotony. Another one of my childhood dream dawns on me... I have learnt in church Sunday School that heaven is a place of precious stones. I was taught that the roads in heaven are made of gold... If it is to be so, with my new found reality, I might have to give a serious second thought about treading the heavenly paths...!!! The royal palace speaks of majesty and prosperity. I am accompanied by my good friend and Cambodian counterpart Chea who is a man in his mid-thirties, I presume. He is soft spoken and very gentle in his mannerism. I have known Chea for nearly a decade. We have met at institutional forums in many different destinations. Chea suggests a ride around Phnom Penn the capital city of Cambodia. I agree with glee. We get into his Sedan a well-used old car. Today being a Saturday, we had set the day for a short official gathering for the morning. This evening we are scheduled to meet a group of women entrepreneurs to learn about their cottage industries. The time in between meetings, have been set free for us to roam the city on sightseeing. I had already loaded the rear seat of the car with fresh lychees brought from a wayside shop. The staff at the Goldiana Hotel have been very courteous in offering me tips on how to choose the fresh fruits. Fresh lychees is a rare treat for me. The vehicle is dense with the sweet fragrance of fresh fruits. This is my first trip to the once war-ravaged county. I am scheduled for two more visits within the next one year to accomplish my official responsibility. Chea takes pride in driving me around the city, a luxury not many Cambodians could afford. We drive around without a proper travel route or plan. He shows a ship anchored very close to the shore. "Would you like to go in?" he asks me casually. "Yea...why not?" My heart leaps to the suggestion. "Do you have enough money?" He asks me with mischief written all over his face. I look quizzically at him, dared not to ask any questions. "That's a casino, people gather in thousands to gamble there. Some people are so well versed in the subject they never lose", said. We keep driving through the market and the not so plush cosmopolitan area. I cannot resist the hunger aroused by the aroma of fresh baked city cake. The lowered shutter in the non-air-conditioned vehicle allows the breeze to bring in the fresh aroma of food in its full force. The lunch time eateries were full of peasants who were trying to grab a pastry or two. To my greatest relief, Chea proposes lunch at a wayside hotel. 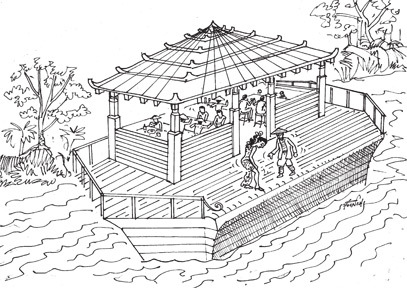 He pulls the car to a stop over a bulky wooden bridge that shows the river underneath through the gaps of the planked foundation. Many houses and buildings in the outskirts are built a few feet higher from the ground propped up on wooden poles. These domains resemble our tree-houses in children's playgrounds. I take slow and cautious steps, scared to look below. Due to my extra cautiousness a shoe heel gets stuck in a wooden chasm. I bend and pull my leg to release myself. Chea flashes a gender discriminating shy smile as he sees the height of my shoe heel that had thus been hidden by my long attire. We sit in a corner to get a better view of the river and the environment and order a bowl of steamed rice with hot and sour fish soup. The soup that was laid has bright red peppers floating in the shimmery liquid. I like my food to be a bit extra spicy. I bite into a whole green-chilli. Chea starts chattering. The conversation turns towards politics...the Khmer Rouge... the killing fields... and so on... with each sentence his expressions turns serious. I listen patiently. The happening is no news to me; it had been random during strife. I have heard of many similar stories during my interaction with rural communities over the last week during my project visits in Cambodia. I had heard such stories related by my own people in the border villages in my home shores. I had been briefed on the country's situation and history by more core team prior to my visit to Cambodia. During the past few days I was narrated by many on the Polpot regime and the civil strife of the country which has been brutal beyond human comprehension. Some of the elderly Cambodian had related to me vivid accounts of the gruesome activities of the militants. I had already purchased a book by Yathay titled Stay Alive My Son based on the Khmer Rouge. Though I am yet to read the book the title itself has fractured my inner-being. Chea turns towards the next table where a fragile old man is seen munching a snack. Chea gives him a hard look and turns towards me. "You know, Indu... I have a bad habit of observing old men...I have got into this habit without my own conscience.." he says sporting a shy smile. I don't quite catch catch his phrase. I shake my head in a gesture of ignorance and mystery. "Looking intensely at elderly men... I don't know when it all started... It was my wife who noticed my behaviour sometime back.." says Chea. His statement makes me uncomfortable. "And I started analysing my habit...it was only after some time that I was able to figure out my own thoughts..." says he with a coy smile. "I don't know whether one of them is my father.." he says. I sigh within me in a relief. "I wish it could be so...for me to meet my dad in an unexpected moment in an unexpected circumstance." His eyes brightens up. "How nice it would be if one of them turns out to be my father... won't it be Indu?" he looks in the old man's direction. His voice drops to a mere whisper mingled with a sigh. "I don't know whether my father is dead or alive. I wish him to have survived the ordeal...to have run-away from the abductors and to have escaped their torture and death...I had not seen his body or a coffin to convince me that he is dead. My heart still yearns to get a glimpse of him. I don't want to go back on time... I will never be able to re-live my childhood. I never would wish for same... to go through the suffering me and my mother endured...All I want is for my father to appear from somewhere and heal my thoughts..." he pauses. "No...no one will ever feel the pain..the pain I go through each day... looking into my son's eyes, I live my father's life. He too may have had dreams for me just like what I have for my child... I don't know whether this life I am leading now is what my father wished me to have and enjoy... Or Whether it was sometime much lower or higher in esteem..." Chea chatters nonstop. I have no intention to interrupt him. It is therapeutic to both of us to be eloquent in this subject to be united in the spirit of pain and disappointment. "I wish my father to be present this very moment Indu..." He slows down. "To see me..to know that I too am a father with unique dreams for my son. I have thousands of questions to ask him.. about what happened...how he felt... what went through his mind...all sorts of questions... I also have a lot to tell him... about what I felt when he failed to return. My anger...our struggles.. about mom..her struggles.. a lot Indu.. a lot...I have a lot to tell him.." He sighs. I feel the melancholy emptiness around us. The emptiness in my inner-being... I feel no pain...no emotions.. numbness engulfs me. I wish it to be the same for Chea..that he too will be relieved and void of all his agony from this day forth..
Or maybe I might lead him to my son and let him embrace my child so that I would be able to re-live my childhood at least for a moment.." I see the wetness welling his eyes. I do not want to see this otherwise bubbly young man to be in this helpless state...no... not in my presence.. I gather myself up to be of some consolation to him. "Memories are the best balm for healing Chea, I hope I will be able to see a better you the next time I see you". I say in a gentle tone clutching his palm. His looks turn grey. I curse myself for my statement. "At one time I thought I knew how he looked in appearance...yea... I think I did remember his face. But now... the harder I try the blurder it get.."
My heart cracks. I look below and see the river beneath through the gaps of the wooden floor. I could see the reflection of a smoky cloud passing through in an aimless direction. The clear waters look stagnant, but the slight ripple moving towards one end indicates a deeper flow. I see an island of ivy floating in a serene sweep...the leaves fluttering gently in a slight shiver. I wish I could dip my toes in the water to test the chill, and to drown and refresh my weary-self. Relieved to be returning home after a week, I settle myself in a corner seat of the "Silk Air" I see the lush greenery of the countryside from the low flying small aircraft. Though we were only a handful of passengers, the chatter in the local dialect is too noisy. I keep thinking of Chea.. trying to feel with him the loss of his childhood.